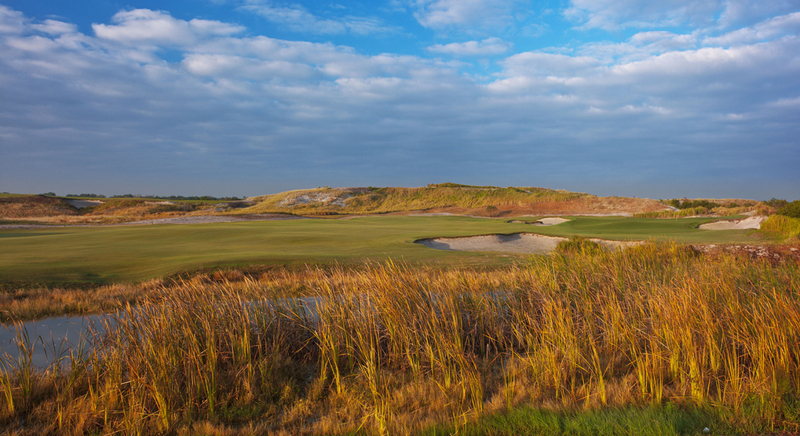 Streamsong Resort courses are unlike any you have played in the Sunshine State. In fact there are only a handful of courses in the world to compare them with. The Mosaic Company, after 60 years of mining the land for phosphate, looked at what was leftover and had the brilliant idea a golf course could take advantage of the moonscape terrain of sand dunes with scattered water-filled mining pits. Located in really rural Polk County, Streamsong is at least an hour from Tampa and an hour and a half from Orlando. The drive is over winding country roads where the biggest hazard is an armadillo crossing, which of course puts Streamsong in the category of a destination golf resort. 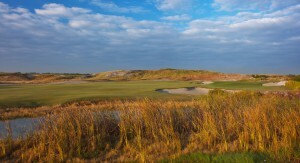 One course, the Blue, was designed by Tom Doak and the other, the Red, by the team of Ben Crenshaw and Bill Coore. They had plenty of room to build on the 2,300-acres of Mosaic’s 16,000-acre parcel part of the 250,000 acres they own and the courses received their names early on. As the story goes when Crenshaw, Coore and Doak were first looking over the site they began marking up a map with colored pens to indicate possible routings and you guessed it. Doak happened to be using a blue one and Crenshaw and Coore a red one. There are no houses and will never be any according to Mosaic…just golf and the 216-room hotel set to open in January. Golfers now are put up in 12 guest rooms on the second floor of the clubhouse but get to enjoy a first class restaurant with views of the dunes some would call breathtaking but most everyone would concede are inspiring. These are walking courses, caddies required, though carts are available. After all this is Florida and in some months it gets very warm and with 150-foot elevation change the decision evidentially was that burros were impractical. If carting rather than walking, forecaddies are required and needed since there are few directional signs. There are stories of golfers becoming if not actually lost at least disorientated among the high sand mounds. Two things were evident from the first hole. There are no paved cart paths just trails of “reject rock” and the landing zones for tee shots are immense with no rough so your fairways-in-regulation stat will get a big boost. There is however lots of water with some fairly long carries but most of their hazard is more visual than real which makes for a good day with the driver presuming one of the hundreds of bunkers or waste areas doesn’t grab your ball. The holes become progressively more difficult on the second shot with green complexes characterized by slopes and dips and swoops and…well, you get the idea. 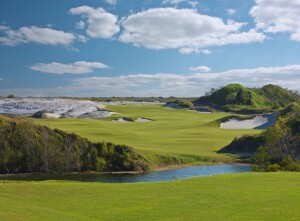 Is playing Streamsong worth the in-season $275 greens fee? The answer is best put this way. The experience at Streamsong is correctly characterized by the word fun, whether your game is up to the challenge or overwhelmed by it.